Look at that! A brand-spankin’-new-and-improved Student Directory! In case you haven’t seen it yet, here is a look at what’s different and new. 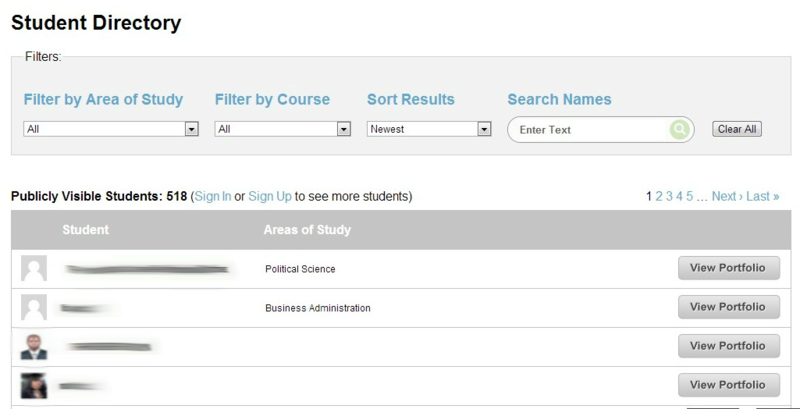 Search By Name: This is the main function of the Student Directory. You can search by first or last name and abracadabra! Those with that name will appear (this search function worked imperfectly before…it is much, much smoother now). Sorting: You can also sort your search results by recent creation, or alphabetical according to name. Interested? Take a look at the Student Directory, find cool folks, and invite them to a Study Group, or even a Meetup. However you choose to do it, dive in! Want more results? Be sure you are signed into the ePortfolio site. Some users have set their privacy settings to “Visible to ePortfolio Users Only.” Others may have set theirs to “Private” — eh, it’s classified. Of course, being all about open, we encourage you to make your ePortfolio account as public as you feel comfortable!